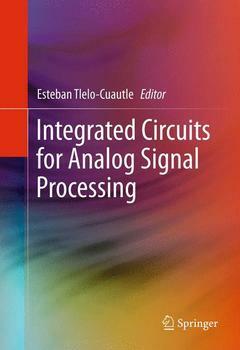 This book presents theory, design methods and novel applications for integrated circuits for analog signal processing. The discussion covers a wide variety of active devices, active elements and amplifiers, working in voltage mode, current mode and mixed mode. This includes voltage operational amplifiers, current operational amplifiers, operational transconductance amplifiers, operational transresistance amplifiers, current conveyors, current differencing transconductance amplifiers, etc. Design methods and challenges posed by nanometer technology are discussed and applications described, including signal amplification, filtering, data acquisition systems such as neural recording, sensor conditioning such as biomedical implants, actuator conditioning, noise generators, oscillators, mixers, etc. Discusses optimization of the active devices/elements for process and manufacturing issues of nanometer technology. Analysis, Design and Optimization of Active Devices.- Nullors, their Bipolar CMOS Implementations and Applications in Analog Circuit Synthesis and Design.- Current Feedback Op-Amps, their Variants, Integratable Implementations and Applications in Analog Signal Processing.- Generation of Grounded Capacitors Minimum Component Oscillators.- Active Filter Design Using a Two-Graph Based Transformation Technique.- Analog Baseband Filter Design Considerations for Wireless Receivers.- Flexible Nanometer CMOS Low-Noise Amplifiers for the Next-Generation Software-Defined-Radio Mobile Systems.- Clocked Nanometer CMOS Comparators.- Low-Power Electronics for Biomedical Sensors.- Sensor Conditioning Circuits.- Steady State Simulation of Mixed Analog/Digital Circuits.- Variability-Aware Optimization of RF Integrated Inductors in Nanometer-Scale Technologies.- A Survey on the Static and Dynamic Translinear Paradigm.